Now on Exhibit: Portals art! While the Portals exhibition (February – June 2016) showcased historical items describing imagined futures, local artists were hard at work researching in Special Collections and creating derivative art, both through programming at the library and in their own studios. We’re lucky to have our exhibit cases jam-packed with selections of this Portals art, on view at the library now through August 15th! Left to right: miniature dress and headdress created by teens in RISD CE fashion classes at the library; 18th century French funeral invitation from the Barrois Collection of Funeral Invitations, alongside a candle by Burke & Hare Co.; drafts, color separations, and layout notes from the Special Collections-themed issue of The Providence Sunday Wipeout. The exhibit includes illustrations, song lyrics, candles, comics, letterpress prints, short stories, headdresses, and clothing designs by Rhode Island artists including Walker Mettling, Mickey Zacchilli, Brian Whitney, Dan Wood, Caitlin Cali, Guy-Maly Pierre, Dailen Williams, Jim Frain, Joe DeGeorge, Veronica Santos, Burke & Hare Co., Jeremy Ferris, Keegan Bonds-Harmon, and many teen fashion designers. New creative works are displayed alongside the historical items that inspired them, including Maukisch’s Das Jagen, Fangen, Zähmen und Abrichten der Thiere (1837), The Necropolis of Ancón in Peru (circa 1880), design classic The Grammar of Ornament (1856), Academie Universelle des Jeux (1824) (from the Haynes Checkers Collection), Rational Recreations (1794), and other gems from the stacks. Some of these artists’ original items are available for sale. (The library doesn’t receive any proceeds from these sales, but we are thrilled to support local businesses and Rhode Island artists!) You can purchase Burke & Hare Co’s Horace B. Knowles candle here, or their Repose en Paix candle here. To get a copy of the Special Collections-themed issue of The Providence Sunday Wipeout comics newspaper, visit Ada Books in Providence or contact Special Collections! 2016 Portals Creative Fellow Walker Mettling put together an amazing, Special Collections-themed comics compilation and story night– and you’re invited! The event, coming up on Monday, June 6th, will feature stories written and read by local artists Veronica Santos, Caitlin Cali, Dailen Williams, Jim Frain, Keegan Bonds-Harmon, Jeremy Ferris & Julia Gualtieri. Library friend and neighbor Joe DeGeorge will provide musical interludes. This event will also feature the release of a brand new, Special Collections-themed issue of the Providence Sunday Wipeout, a large-format comics newspaper. Wow! This not-entirely-literary evening will be hosted by Walker Mettling. See you on June 6th at 6:30 p.m. in the PPL Auditorium! If you regularly check the library’s facebook page or other social media, you may already know about Special Collections’ 2016 Creative Fellow, the inimitable Walker Mettling. Walker is working with our collections for the duration of Portals, and is using his fellowship as an opportunity to create new illustrated work related to the exhibition’s theme. Stay tuned for details on where and when you can see some of his fantastical creations! In the meantime, here are photos of Walker reading a comics newspaper that he printed on a risograph, inspired by the large-scale format of 1860s issues of the Providence Journal that he read in PPL’s Special Collections. As we’ve mentioned in passing, we’re hard at work preparing for our upcoming 2016 exhibition and event series, Portals: History of the Future. 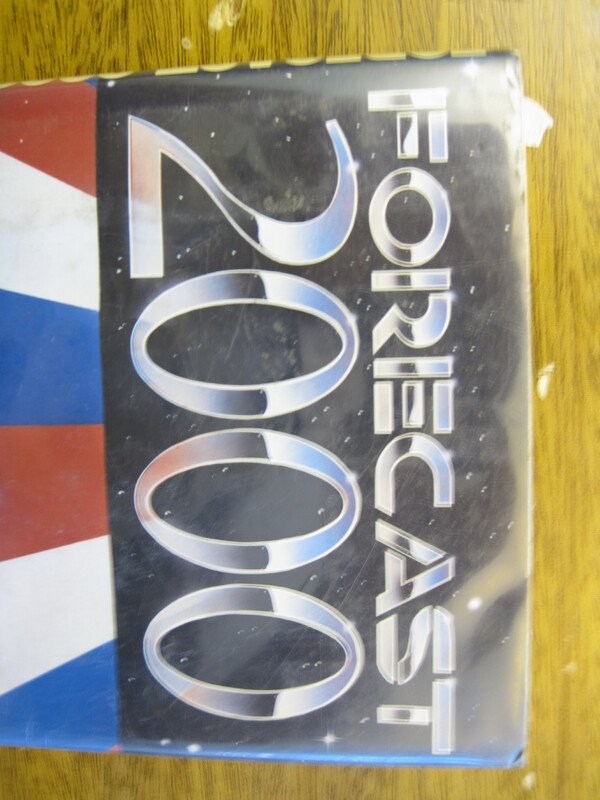 Forecast 2000 was written in 1984, mind you, so the predictions aren’t terribly far-fetched. 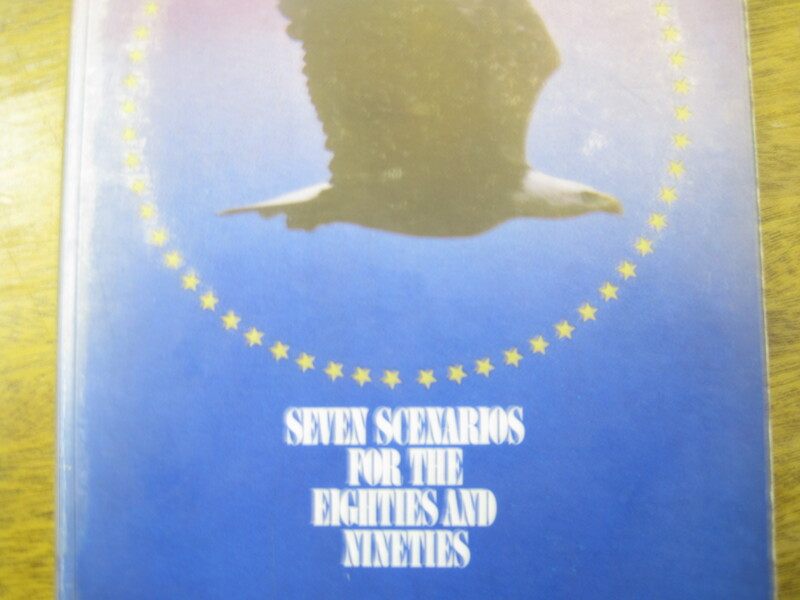 Seven Tomorrows has lots of fun charts and imaginary statistics, and its scenarios provide a surprisingly good read. 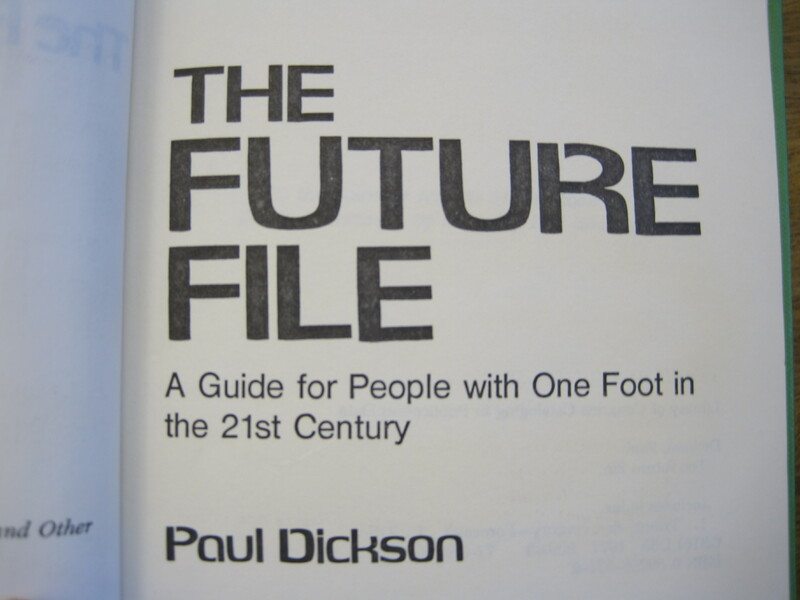 The oldest book of this stellar batch is the 1977 Future File, a slightly sci-fi compendium of information for the forward-looking thinker. 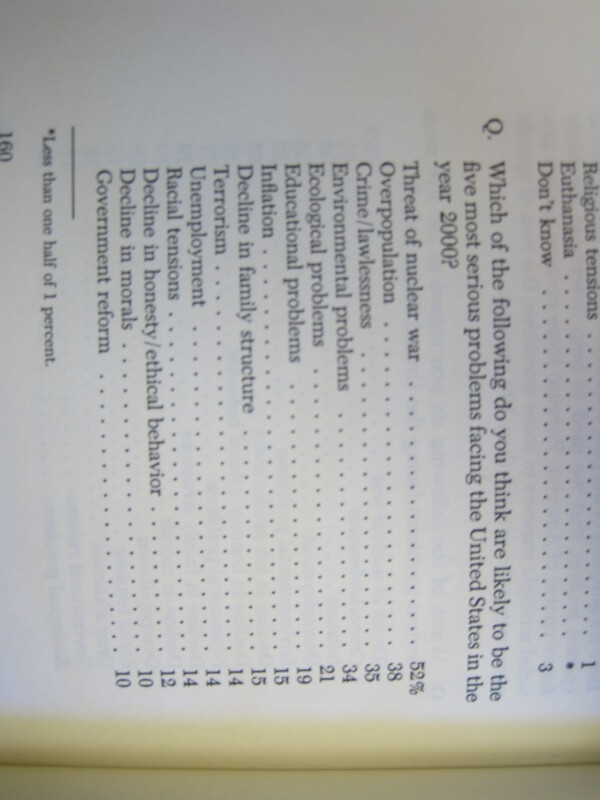 One section of this book has predictions by year, culled from all kinds of past official publications. 2000: year of nuclear electric spacecraft. 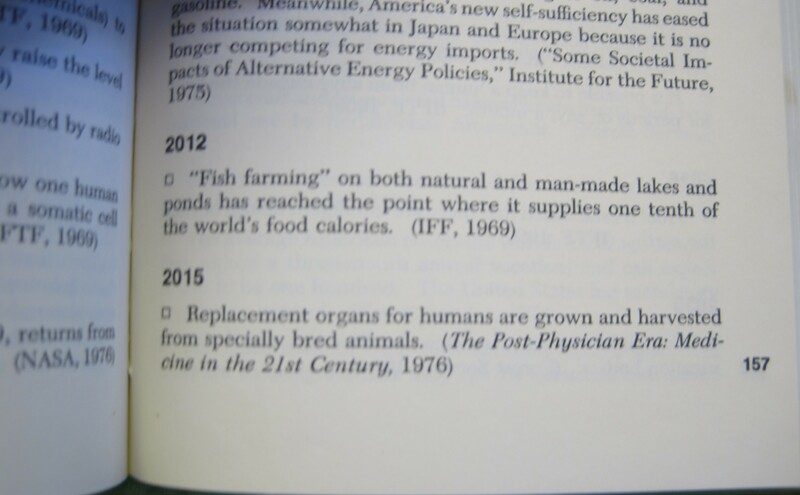 2015: replacement organs harvested from farmed animals. 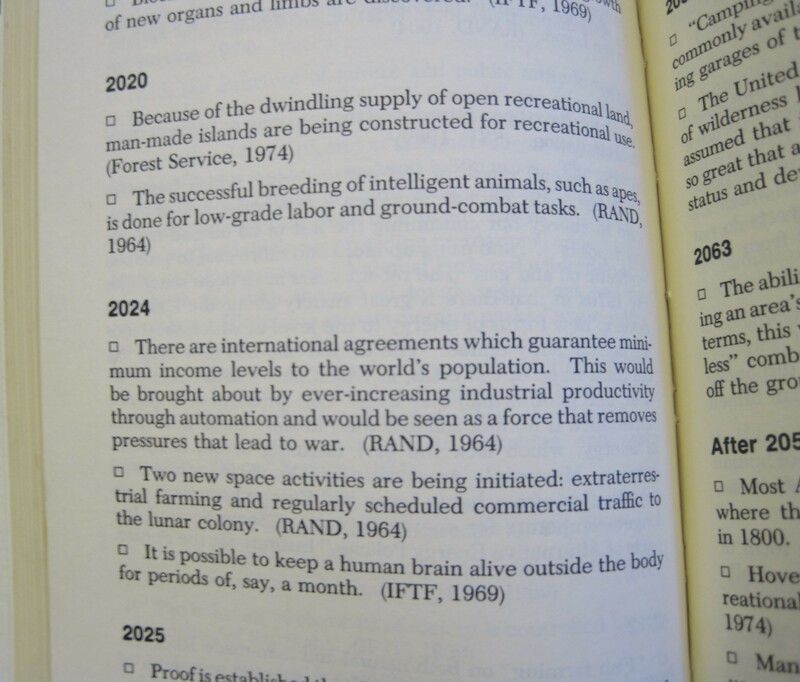 2024: lunar colony and extraterrestrial farming. Isn’t the future grand? This week’s Art//Archives Visual Research Hours will also serve as our first sneak preview of some items that will be featured in the upcoming 2016 exhibition and program series, Portals: History of the Future. We’ve been poking through scores of old science magazines from the late 19th and early 20th centuries, and we’ve picked a few highlights for your pleasure and entertainment. An odd shout-o-phone! A potato-like Arctic face mask! A royal coach made out of pipe cleaners! If you’d love to spend some time with this fabulous 1940 issue of Popular Science or similar magazines, swing by Special Collections on Tuesday between 10:30 and 1:00.